I have a problem with the F512 BB LM silhouette in GTR2 as soon as I call them GTR2 jumps. I do includes not why. I installed as it was served. "I have a problem with the F512 BB LM silhouette in GTR2 as soon as I call them GTR2 jumps." Sorry, but jumps is not a known terminology that we use. Can you describe in better more clear terms what happens please? Yes when I want to run the car it does not load the, I did not Visual, the fingers of the hand flashes, and all suite after I "GTr2 to encountered a problem etc..." and then I get on windows. I hope to be more clear, sorry for the vocabulary. Thank you in advance to be able to help me. and further updated by me (TICTOC) for GT Legends. Which version do you have? If it's from\by TICTOC, it's not for GTR2, but for GT Legends. Yes I know TICTOC is for GTL, even when I of GTL convert to GTR2 this makes me the same thing. It is a version for the mod GTL-GTR2 (F512BBLM_V1_0 this is what it's called). Well, it seems that I can't find the mod, and although I have GTR2, I don't play it, so I really can't offer any help. Sorry. Something you might try, though; download the mod again. You may have simply downloaded a bad copy the first time. Doesn't take much to stop a download from installing correctly. If the download 'hiccuped' just once, that's all it would take to make it not work. OK thanks I'll sho redownload the mod. But the I have to go to sleep because I get up early. Here is a link for the GTR2 version. So as promised I keeps you current. I have all removed, then reinstale GTR2, then GTL/GTR2, and 3 BB 512, the 512 BB LM ferraries mods from Driving Italia, thank you Joeschmoes, but unfortunately, the other 2 mods work but not the 512 BB LM silhouette. I have reinstalled the Ron 123 for GTL/GTR2, to convert the F512BBLM mod silhouette in GTR2 GTL, but nothing to do this still not working. If you have an idea about my problem, because there I do not know, I am not very good but then I dry, as on the other car (MG and Aston Martin Zaggato). Thank you all for taking 5 minutes. It would be interesting to know what says the trace file. netcomm.cpp 7902: NetComm checking command line: "-trace=1000"
tire_manager 1171: Non-existent tire brand ""
Thank you, kindly help me. That's a lot of missing .hdc files, are you sure you did copy the proper skins in the 512BBLM folder? Is it possible that you copied them elsewhere? BTW, there aren't that many BBLMs even counting the independent skins released, so I believe that you have other mods installed where they shouldn't. The last line of the trace means that a texture for one of your cars is missing or has been renamed. toutfou, have you gotten a trace file yet ? Soze, yes there were other mods, so I have everything removed, and put back only GTL/GTR2 + F512, and unfortunately this has done the same thing. All three 512BBLM Chassis styles (1, 2 & 3) have the material wc_team_body2_pa and the Shader cube map is set for black.dds which should be packed into the Stex.GTR MasFile normally so I do not really understand why you guys are having problems unless the black.dds tex file is missing from your Stex.GTR file. If you look into the Stex file and black.dds is missing you can add to it or just drop the file into the Ferrari 512 BB LM Silhouette folder. fisheracing just took us to school, I looked in a bunch of texture files for that one, but didn't know enough to think of the "base" texture files..... Thanks for the lesson fisheracing !!!!!! 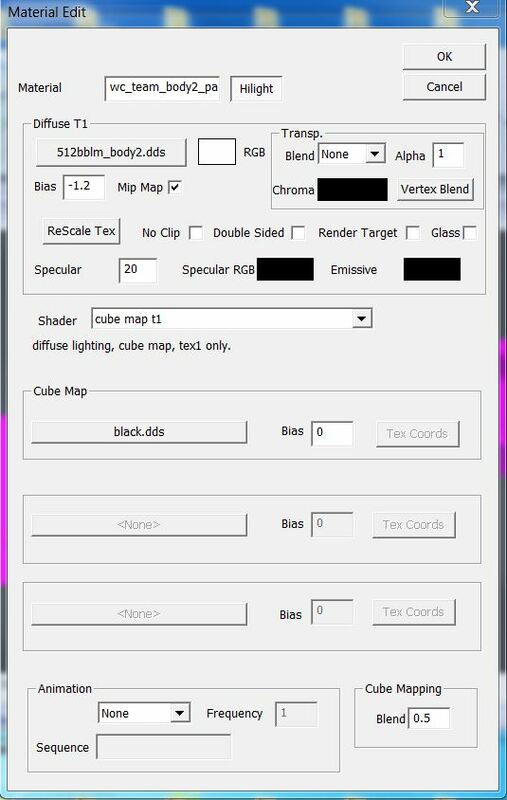 When I went to see in Geditor if I had Black.dds in Yes, however I do not know how to check with the "edit material" I've never done. Does this .CAS file have anything saying .GTL in it? If so then change it to .GTR and try your mod again. Joeschmoe is it possible to have another place to download the BLACK.dds, because with gamefront he refuses.